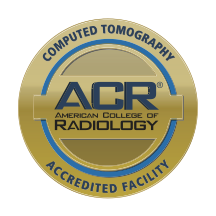 Compass Cancer Center has been awarded the American College of Radiology’s gold seal of accreditation in computed tomography (CT scanning), signifying the highest level of image quality and patient safety. The gold seal of accreditation is awarded only to facilities meeting ACR practice guidelines and technical standards. This means our facility has voluntarily gone through a vigorous review process to ensure that we meet nationally accepted standards of care. The ACR gold seal signifies that our personnel are well qualified, through education and certification, to perform medical imaging, interpret your images, and administer your radiation therapy treatments. It is also your assurance that our equipment is appropriate for the test or treatment you will receive and that our facility meets or exceeds quality assurance and safety guidelines.